Towers Watson is a leading global professional services company that helps organizations improve performance in the areas of benefits, talent management, rewards, and risk and capital management. The firm employs over 15,000 associates worldwide. Eli Fernández is the UK-based IT Service Management Lead for the Europe, Middle East and Africa region, which has more than 5,000 employees spread across 16 countries. His team manages the resolution and internal communication of all service-impacting incidents, as well as delivering IT service management, on-site support and network services. The organizational structure at Tower Watson presented Fernández with a number of challenges. The 5,000 staff and 15,000 associates worldwide were distributed across 16 countries, speaking multiple languages. Effectively communicating with all staff given this structure was naturally difficult. Fernández needed to improve IT outage communication and reduce the number of calls to the service desk. He was also keen to gauge message success by tracking how many employees have seen the messages. 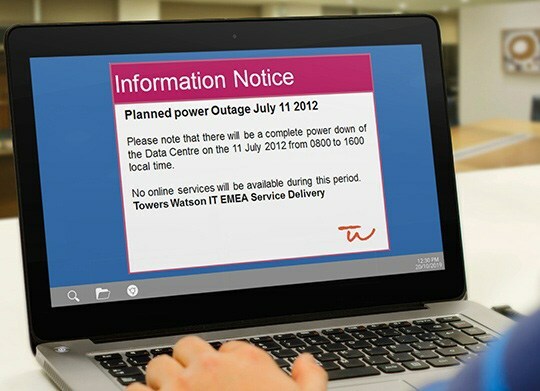 Towers Watson have been using SnapComms Desktop Alerts since August 2012 as a mechanism for updating staff about high-priority IT outages and notifications. Desktop alerts are ideally-suited to this, being designed for high impact to get employee attention immediately, whatever screens or devices employees use – desktop, mobile or digital signage. The IT team at Towers Watson has developed a set of branded IT outage notification templates for their desktop alerts, based on a simple traffic light system. Three of the templates are used for incident management — a new notification has a red theme, an update is gold and the closure of that issue is green. The fourth template is plum and is used to communicate upcoming work which might result in service interruption. While Fernández says that “what we do is common sense,” there is a culture within the team of setting high standards. They use simple, jargon-free communications in English rather than trying to translate more technical information into local languages. 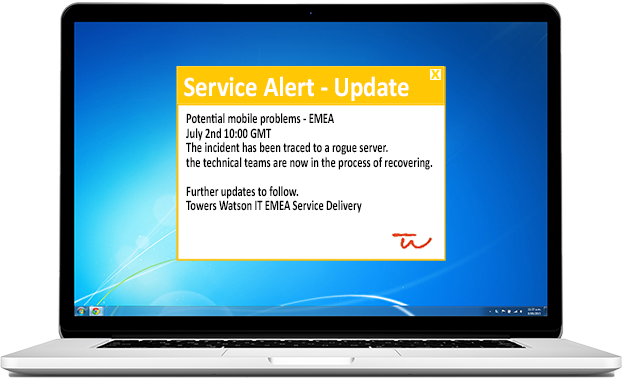 This focus on simplicity, quality and consistency has made desktop alerts highly effective in conveying the status of system outages to Towers Watson staff and third-party IT service providers in multiple locations and different time zones. Fernández says that the use of clearly-defined templates has provided a “reasonable level of protocol.” But he also explains that Towers Watson is just scratching the surface in the way it is utilizing SnapComms, given the capabilities of the software. While they could use it for other internal communications, they choose not to, and have restricted management of the tool to 12-15 administrators globally. Good design, quality and consistency in messaging and offering flexibility to users have resulted in a lot of positive feedback about the desktop alerts. By and large associates like receiving them and Fernández concludes that, “If they see an alert they know it is worth reading.”. Send a brief description of your communication requirements, and we'll get back to you with a personalized demo experience!